24/7 emergency locksmith or repairs. The key was left lying in the vehicle ? The key is broken and stuck in the lock ? The key is on the inside in the front door lock ? Kaiserslautern, Ramstein or Landstuhl ? No problem, our emergency locksmiths can help you. With our 24 hours locksmiths service, we will open your door, regardless whether the lock is locked or the key in the lock is broken, whatever, we can help. As a mobile emergency locksmiths, our trained in Kaiserslautern locksmiths provide a professional and comfortable locksmith service. You locked yourself out and need a lock opening ? If you need a emergency Locksmiths Service ? Easy Call 0162 439 6216 and our emergency Locksmiths comes to you. Siegelbach, Katzweiler, Erfenbach, Otterberg, Otterbach, Höringen, Bann, Miesau , Hütschenhausen. All lock assemblies are professionally carried out in our company. We offer a fast and reliable 24-hour emergency response for locksmiths Services at very low prices. We stand behind our workmanship and guarantee 100% customer satisfaction. 24 hours a day 7 days a week for you to go. locksmith tools and locksmith supplies at your disposal for locksmith services and repairs. Our locksmiths are happy to fulfill your locks mithing. For our work we have the most manufacturesof locks and associated door hardware. We supply best locksmith and locksmiths Services for your needs at home. The locksmith technicians Service are reasonably priced for all locksmiths fields. be done by a professional locksmiths at an affordable price. For locksmith services we have qualified staff, we will solve all your locksmiths problems, just a satisfied customer, comes back. House - Apartment - or Car Doors. for commercial, Residential, mobile locksmiths and repair Services. open, pick, replace, Locksmiths, install locks, fix locks, open locks, pick locks, unpick lock service. 24/7 Lockout or Lock Installation Services. 24/7 emergency locksmith or repairs. The key was left lying in the vehicle ? The key is broken and..
You need a emergency opening Service ? For house or car doors, call 0162 439 6216. 24/7 emergency locksmith..
Locksmiths & Repair Service for Kaiserslautern Areas : Ramstein, Landstuhl, Mackenbach, Weilerbach, Schoppp For Car and House doors. You lost..
Öffnungszeiten: 24 hour - Die Welcome by Emergency Locksmiths for the countries Kaiserslautern, Ramstein, Landstuhl Öffnungszeiten Kaiserslautern können zu Feiertagen wie Karneval (Rosenmontag Faschingsdienstag Aschermittwoch), Valentinstag, Ostern (Gründonnerstag Karfreitag Ostersonntag Ostermontag), Tag der Arbeit und Himmelfahrt abweichen. Wir empfehlen, sich auf der Webseite emergency-locksmiths.de vorher zu informieren, ob es sich um ein lokales Locksmiths Kaiserslautern Geschäft handelt. 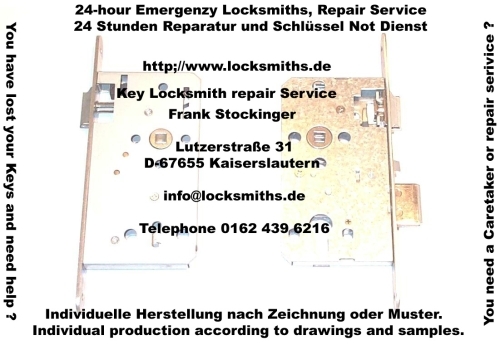 Bei Änderungswünschen zu Erfahrungen und Locksmiths Test Erfahrungsbericht Bewertung von Welcome by Emergency Locksmiths for the countries Kaiserslautern, Ramstein, Landstuhl Lutzerstraße Kaiserslautern senden Sie uns eine E-Mail.